Unfortunately, I did not participate in World Wide Knit in Public Day on Saturday. Why? Yeah I didn’t go anywhere. But hey, I typically always have knitting with me. Always. On Sunday, I decided that when I dropped Cher off for grooming I would spend a little time to myself getting a pedicure and I took the Rye socks for my godson with me. 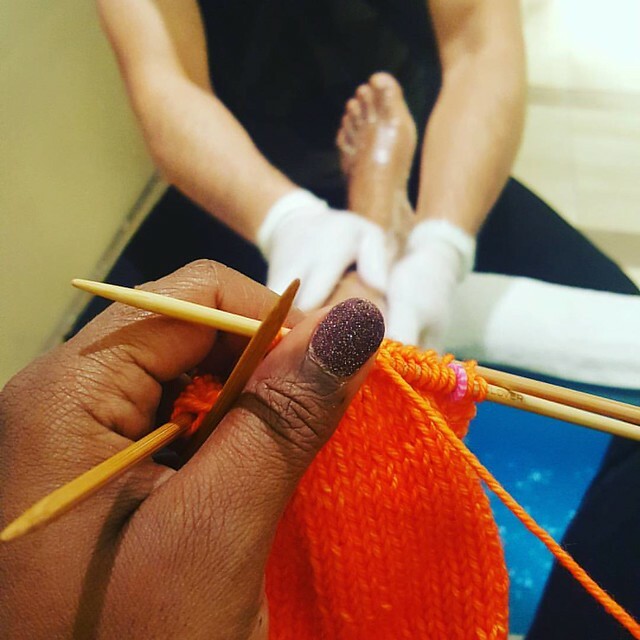 My nail tech, Vinnie, was super curious and asked me a million questions – which is typically what happens when I knit in public. Especially if I’m working on double points – those 4 needles going much look really crazy to someone who doesn’t knit. I know they used to intimidate me! One of the comments Vinne made was, “I only ever see old ladies knitting, I never see someone young like us doing that.” HA! That tickled me because if you ask my students they think I’m so old (for the record, I’m 37). We talked crochet, knitting and then he asked me how did I get started knitting and how could he start! He even asked me where he could get supplies and then wanted to see pics of my finished objects. I of course shared my husband’s sweater because that’s always an impressive piece. I love being a knitting ambassador. Whenever a friend shows interest I’m thrilled and always hoping they’ll become as fanatical about knitting as I am. HA! I know that’s a tall order but one day perhaps I’ll have that friend that falls down the knitting rabbit hole like I did. Did any of you participate in Knit in Public day? What’d you do? I go to that nail salon every other week so I told him if he takes up knitting to let me know next time he sees me! It’s my godson’s favorite color! I’m hoping he really loves the socks when I’m finished. 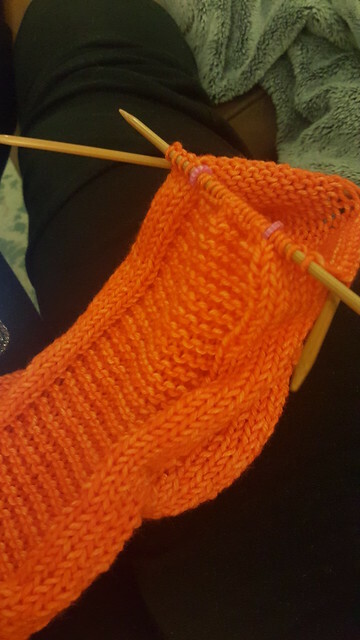 I didn’t participate in Knit in Public Day; I tend to knit in public as a matter of course, and my LYS wasn’t holding any events (understaffed). It’s interesting that people still have the stereotype of grannies knitting (and you gotta love grannies) since it seems like for the last ten years, it’s been all about trendy knitters and the like. Oh well. I honestly don’t think people notice until it is someone “younger” like us. We don’t look like little old ladies so it’s intriguing but I know that knitting is so huge right now! I see it everywhere! Ha! I picked an OPI polished I believe called I Accomplished Absolute Zero. It’s pink and black glitter!